Right-CommLoad™ is based on the internationally accepted ASHRAE heat loss/gain standards (ASHRAE 62 standard ventilation calculations), and supports both CLTD and RTS load calculation methods. 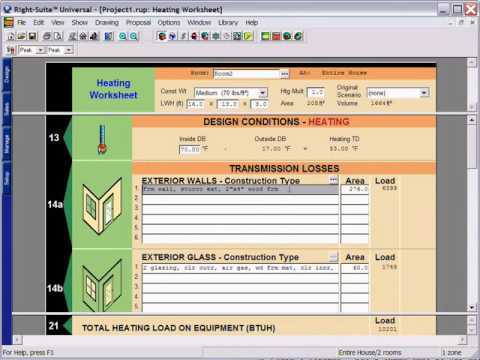 This program uses the 24-hour by 12 month ASHRAE Handbook of Fundamentals methods to compute light, medium or heavy heating and cooling loads for an unlimited number of zones. View overview video. In conjunction with Right-Draw®, Right-CommLoad™ will rapidly calculate your load once building materials are selected. Right-CommLoad™ uses a layer-by-layer construction material builder, prebuilt with hundreds of common materials and building components and the option to add materials with custom thermal properties. With our exclusive Hotlink™ technology, Right-CommLoad™ will recalculate instantly as you enter figures enabling you to play "What If?" just by changing one value in the easy-to-understand form. View the shape of load peaks and valleys. Right-CommLoad™ offers a colorful Load Meter which shows the shape of load peaks, not only over 24 hours, but also over 12 months, giving you a full range of possible conditions effecting your load, as well as automatically highlight the peak month and peak hour. Edit usage parameters using Schedules. Easily turn on lights at 7AM and then gradually turn them off, starting at 4PM, or whatever contour you choose. This may be applied to people, thermostat settings, plug loads, et cetera. Right-CommLoad™ also calculates loads for odd usage facilities like a churches or nightclubs, with great accuracy. Customize building material options used for each project. Make global changes, or change on a case by case basis to material options such as color, shading, delta t, et cetera. Calculate fresh air requirements using ASHRAE 62 methods. ASHRAE 62 is required by Energy Star and other building codes and programs. Choose from CLTD or RTS methods. Includes ASHRAE’s heat gain from occupants for various activity levels. Built-in library of thousands of material types for building surfaces...RCL also makes it easy for you to use your own special material types. Right-CommLoad™ is the fastest and easiest way to determine your complete ASHRAE load calculation breakdown for any commercial project. Choose to utilize the custom pie charts to demonstrate to customers their load breakdown for any zone or group of zones. Right-CommLoad™ uses 24 hour by 12 month ASHRAE Handbook of Fundamentals methods to compute heating and cooling loads for an unlimited number of zones.